Wauseon shortstop Alisa Shelt catches a lineout during Thursday’s NWOAL matchup with Liberty Center. The Indians took down the Tigers 9-4 for their first league win. 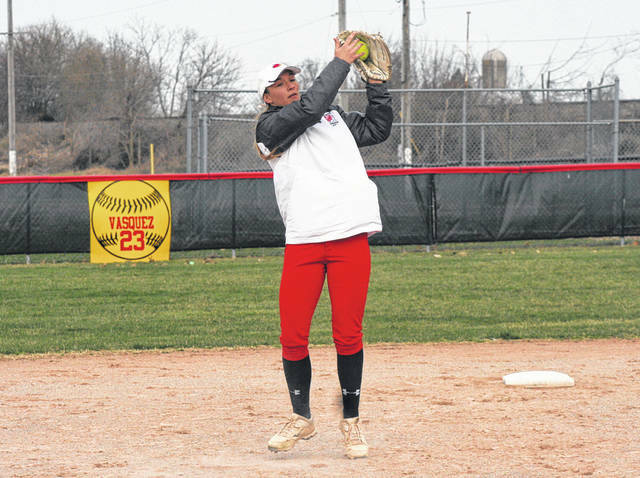 Wauseon jumped on top of Liberty Center 8-0 through three innings, managing a 9-4 home win in Northwest Ohio Athletic League softball action Thursday. The Indians led 3-0 after the first, then a Payton Albright sacrifice fly scoring Chelsie Raabe, made it 4-0 in the second. Later in the frame, after a walk loaded the bases, Alisa Shelt’s double to right field cleared the bases for a seven-run Indian lead. With the bases loaded in the bottom of the third, Albright reached on an error that scored another run. However, LC got one back in the next half inning thanks to a bases loaded walk. They then added one in the sixth on a suicide squeeze, slicing the Wauseon lead to 8-2. The Indians responded in the home half of the inning. Shelt led off with a walk, she stole second, reached third on a wild pitch, and came home on an errant toss to third by the Tigers’ catcher following the wild pitch. This provided enough insurance, making the two runs by the Tigers in the top of the seventh meaningless. The Indians were victorious in a home doubleheader against Hilltop Saturday. They won 10-5 in game one and 4-2 in game two. Wauseon pitchers Juli Spadafore and Macee Schang struck out a combined 20 batters over both games. Albright went 1 for 2 with two walks and three runs batted in to lead the offense in game one. Harlee Floss (1 for 3) drove in two runs in the second game. Wauseon is at Delta today and travels to Sylvania Northview for a game Tuesday at 5 p.m.